Does Heating Metal Make it Weaker? Achieving the perfect metal properties often requires heat. There are many different ways that heat can alter the properties of metal. However, does heating metal make it weaker? Here are some common ways that heat treating metals changes the basic properties and strength of metal. Structure: By displacing atoms, heat can form new metallic structure. Also known as allotropic phase transformation, this is an essential transformation that is used with iron and steel heat treatment. Magnetism: Perhaps the most common way that heat makes metal permanently weaker is with a magnetic charge. Heating nickel, iron and cobalt to temperatures ranging from 626 to 2,012 degrees Fahrenheit can cause these metals to completely lose their magnetism. Magnetism can be useful in some instances, but in others it can be unnecessary or inconvenient. Thermal Expansion: This transformation is not only used when crafting metal products but also can be a liability. Metal expands in volume, length and surface area as it heats up. This can continue to occur even as the metal is shaped and put to use, so everything from sewer pipes to bridge cables needs to account for thermal expansion. These are the basic ways that heat can alter the characteristics of metal. However, when heated and cooled in specific ways at specific temperatures, heat can alter metal in far more unique and specialized ways. Learn how heat treatment can specifically alter metal to fit a variety of different needs such as malleability, hardness, softness, magnetism and more. The short answer to the question regarding making metal weak is yes, however, only for some metals. 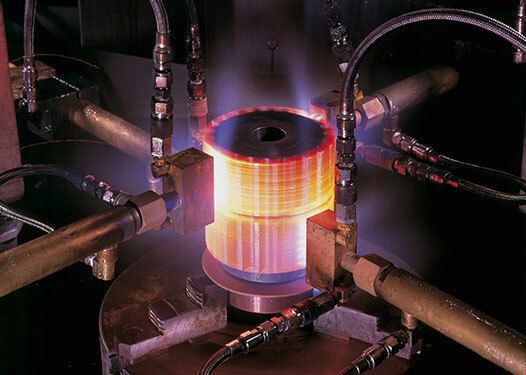 The process of annealing can soften a variety of metals. Brass, steel, iron copper and silver can all be made weaker by heating the metal to a set temperature and cooling it slowly. It’s not only used to create softer metal products but also more electrically conductive ones. However, it would be incorrect to state that heat always makes metal weaker. Hardening is another process used by heat treating companies to actually create more durable metal components. This is used for steel and similar alloys and creates hard, yet brittle metal. Another popular process where heat is used to alter metal is tempering. Tempering increased the ductility of hardened steel. It is used to keep the benefits of hard steel, with less of the brittle qualities. Finally, normalizing alloys is another common way to treat metal using heat. It starts with heated metal that is air cooled. This simple act, if heated to an exact temperature range, can create a more pure, hard metal. It’s often used to create steel that is stronger than annealing the metal, but also creates a less ductile product. So, heat can indeed make metal weaker. However, there are many processes where metal is strengthened by heat. The alloy, temperature range and cooling methods all need to be considered before determined whether metal will increase or decrease its hardness through heat treatment. Discover the Best Heat Treatment Service Whether you’re searching for weaker, more malleable metal through heat treatment or stronger, more durable products, SST offers one of the most professional and exacting steel heat treatment services in the country. Discover why we’re the only approved company for heat treatment of specific flight safety configurations. If you have any more questions about heat treatment and metal processing, or if you need any services from one of the best heat treating companies in Michigan, contact us today.